It’s that time of year! 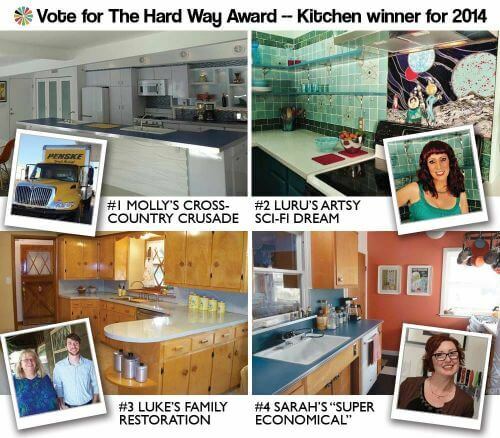 We invite you to help us choose our “The Hard Way Award” winners for 2014. In our Kitchens category (Bathrooms, tomorrow) Pam and I chose four four finalists from among all the reader kitchen remodels we spotlighted last year. Take a look — and then vote now through Tuesday night for your favorite. Your vote will help inform our final selection, which we will announce in one week. Be sure to vote for your favorite among our five bathroom finalists, too! 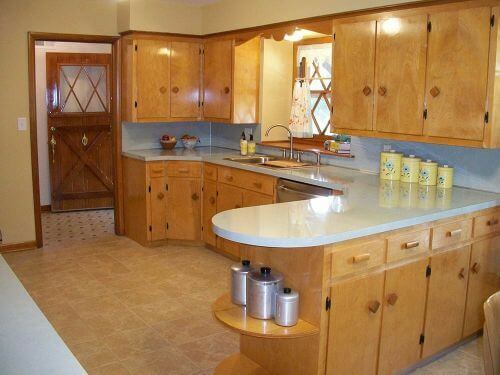 Reader Molly got an 1,800-mile adventure along with her vintage steel kitchen cabinets. 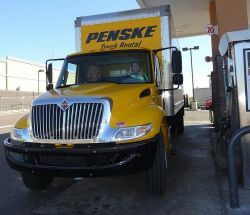 This intrepid retro remodeler commandeered a rental truck — and the help of a good friend — to pick up two different sets of vintage steel kitchen cabinets from Missouri, took them for powder coating in Illinois, and then drove them cross-country to her vacation home in Palm Springs before having them installed in her kitchen. One thing is for sure — there were no shortcuts on Molly’s renovation journey. 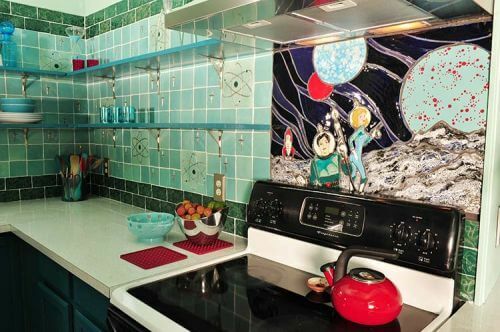 LuRu — a ceramic artist — knew she had to do something to make her home’s tiny kitchen more visually interesting. She had a limited budget for the remodel, but she got creative and used her talents to hand make 64 square feet of tile for her kitchen backsplash. Not only are the tiles LuRu made gorgeous, but she also made a special ‘stovescape’ depicting an atomic space theme. LuRu’s hard work and vision transformed her tiny kitchen a real work of art. Reader Luke and his parents made restoring the flood damaged, poorly maintained kitchen in their new 1953 home a family affair. 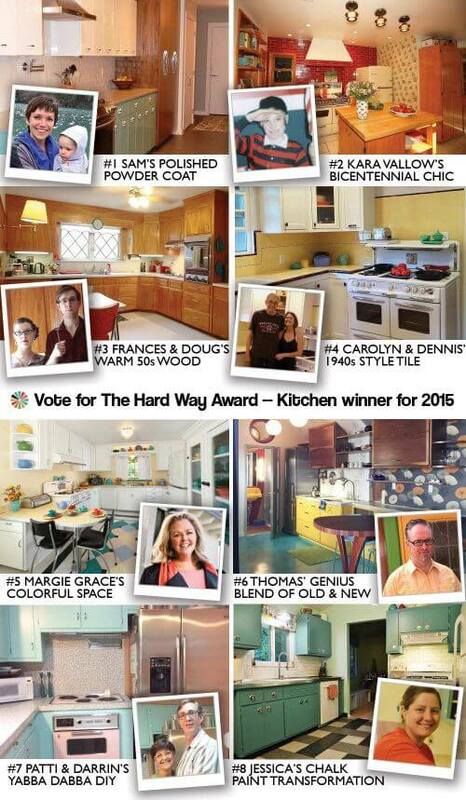 Instead of gutting the space, the family realized the value of the kitchen’s original features. They chose to instead repair, rebuild and refinish the kitchen cabinets and add new appliances, new flooring and laminate countertops. Even Luke’s grandmother got into the restoration by sewing curtains for the space based on a design she saw in our post on cafe curtains. This family labor of love helped to turn this once sad space into a sparkling midcentury kitchen once again. Reader Sarah — an avid cook and food blogger — needed to remodel her tired kitchen, making it more user friendly, cleaner and more inviting all at once. With only a limited budget, Sarah got creative — finding a whole boatload of wood cabinets taken from a local Air Force base for $200 at her local Re-Use store. To complete the budget-friendly renovation, Sarah used aluminum edged laminate countertops, inexpensive but reliable appliances, and VCT flooring. With ample storage and counter space, Sarah now has a fun, cheery and functional kitchen she loves. 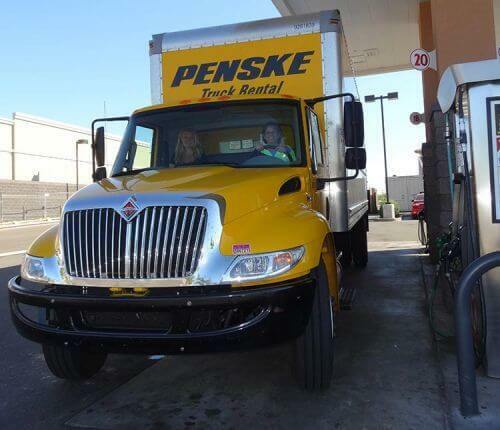 Thanks for helping us choose a winner — we’ll announce the winner Thursday, Jan. 22. Super original and they did it all themselves without a lot of $ spent. Great job!! What a tough choice! What should we value higher when making this selection for “the hard way”: no-holds-barred determination to create a particular look with vintage materials, whimsy + crafting expertise + perseverance, determination to save what’s good, honoring the notion of “modest” while injecting cheer and personality? To me, this contest is less about the outcome, more about the conscious choices, including the choices of constraints. I haven’t made a pick, but I’ll think about it more. My answer to your question: Yes. “The Hard Way” is about all these elements in any number of combinations. 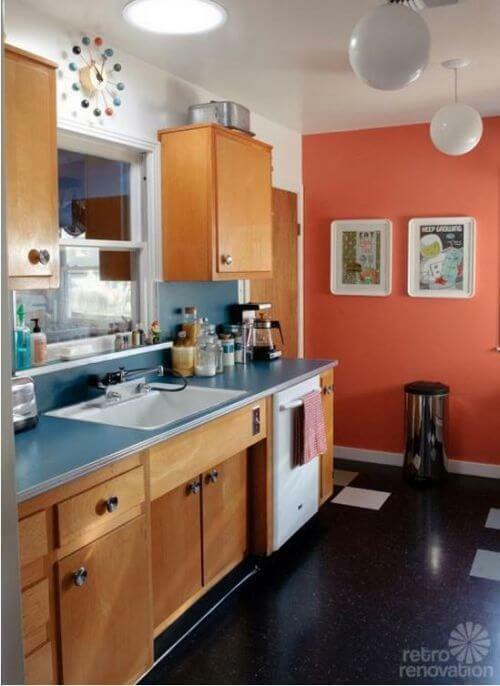 Sara’s super economical retro kitchen for me. It looks comfortable and fun. The Liberace magnet on her fridge pushed her over the top of the others for me — just live her kitchen! 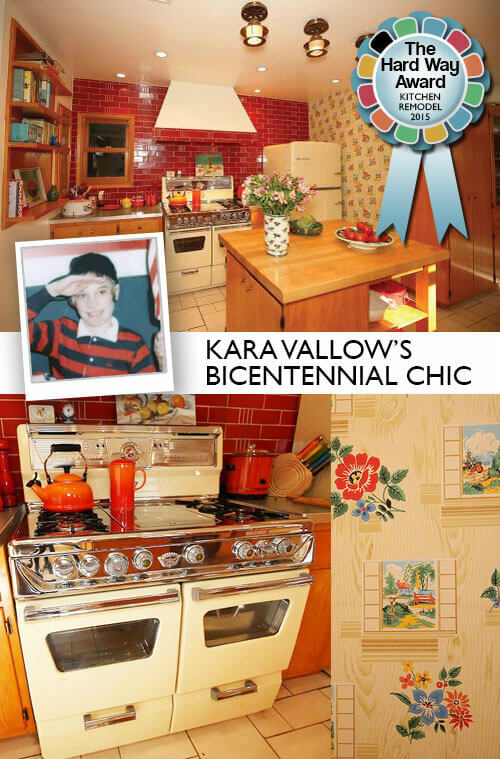 That would be “love her kitchen,” although I can imaging living in it! I wish I could vote for everyone, all of the projects are amazing in their own way. Kudos to all the Retro Renovators out there!